When bad things happen, who’s behind them–God or the devil? After more than thirty years in a wheelchair, Joni Eareckson Tada’s intimate experience with suffering gives her a special understanding of God’s intentions for us in our pain. 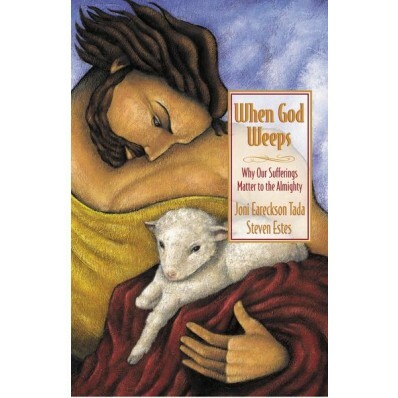 In When God Weeps, she and lifelong friend Steven Estes probe beyond glib answers that fail us in our time of deepest need. Instead, with firmness and compassion, they reveal a God big enough to understand our suffering, wise enough to allow it—and powerful enough to use it for a greater good than we can ever imagine. Steven Estes holds Masters of Divinity and Masters of Theology degrees from Westminster Theological Seminary and Columbia Bible College. He is the senior pastor of Community Evangelical Church in Elverson, Pennsylvania. With Joni Tada, he co-authored A Step Further and also wrote Called to Die, the biography of slain missionary linguist Chet Bitterman.